If their first game after losing All-Pro defensive tackle Geno Atkins is any indication, the Bengals will be just fine when it comes to pressuring the quarterback. Yes, Cincinnati lost to the Ravens in overtime, 20-17, but the Bengals had the eighth-ranked pass rush in Week 10 according to The MMQB Pressure Points ratings, which is well above the ranking (27th) they held heading into the game. Dunlap was one who did more in Atkins’ absence, compiling two sacks, six hurries and two hits to win our Edge Rusher of Week 10 award. 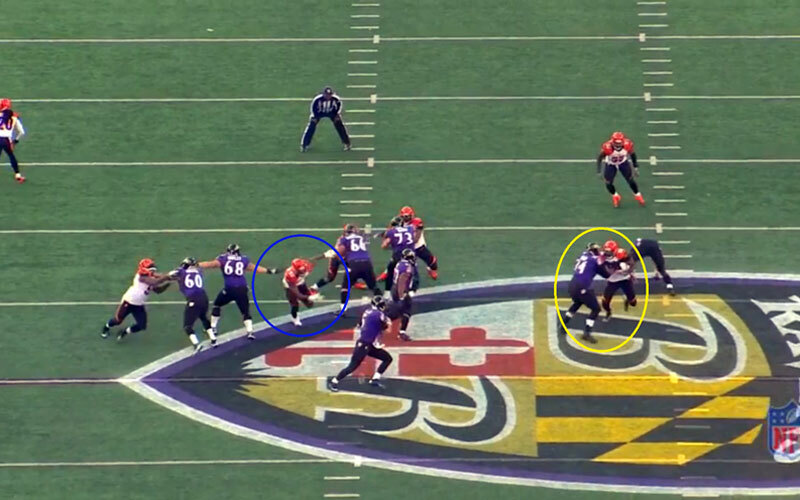 The Bengals are deep and talented on the defensive line, which will help them move on without Atkins. Brandon Thompson and Devon Still are the immediate replacements at tackle, but ends Dunlap, Michael Johnson and Wallace Gilberry have an impressive rotation. The whole unit is close, which Dunlap feels is a key to continued success. On 3rd-and-10 with 4:12 left to play in regulation, the Bengals used that teamwork to perfection. 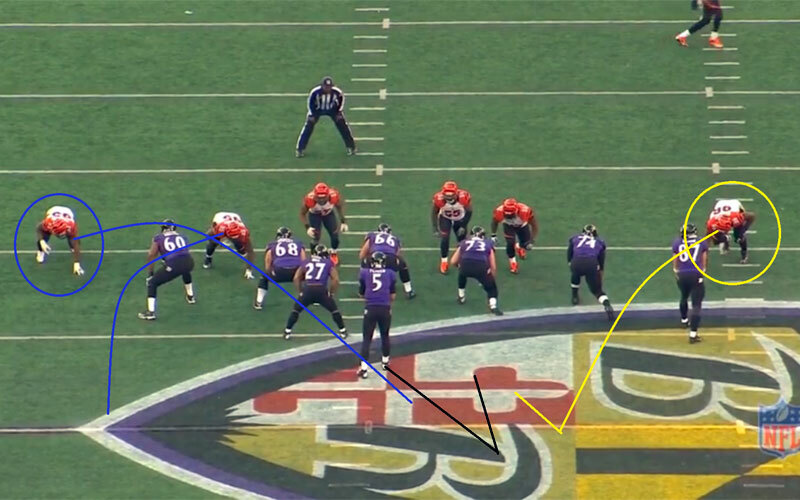 Gilberry ran a game with Johnson on the right side of the line, springing Johnson to rush hard at Flacco as Dunlap set a hard edge for the pocket on the other side. 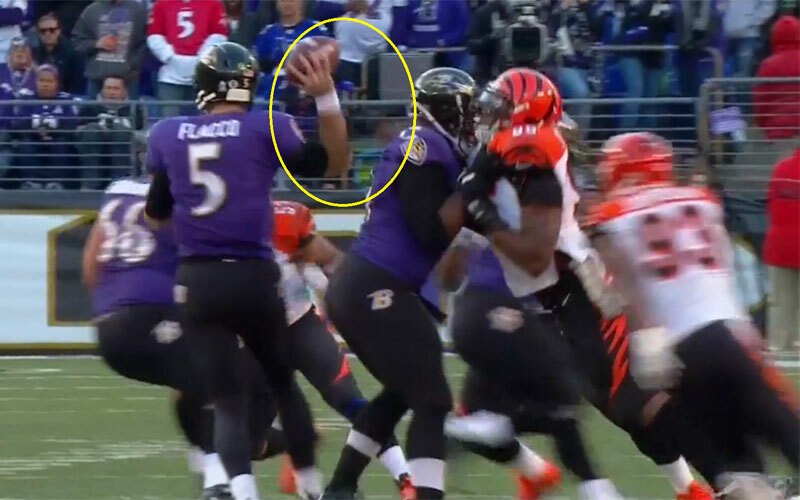 When Flacco got close enough, Johnson swatted the ball way for a sack fumble, with a “sack assist” going to Johnson. An ensuing Andy Dalton interception meant that the turnover was wasted, but the defense had done it’s job—and it will have to force even more turnovers with Atkins (torn ACL) on the sideline. 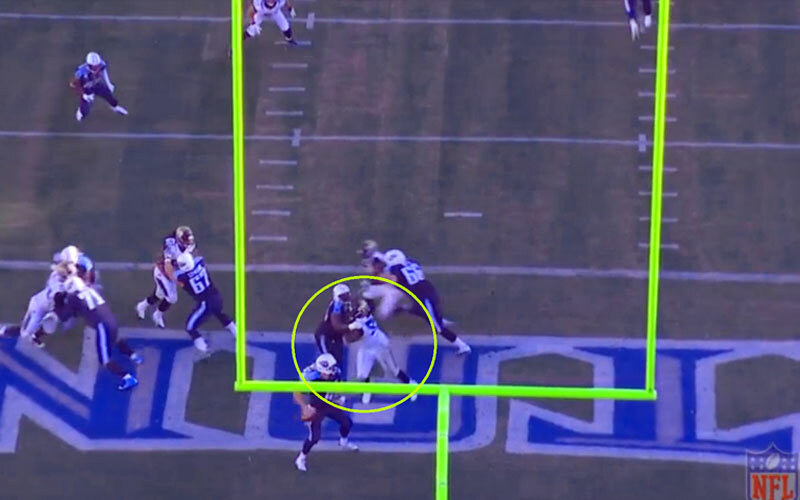 Even though he covers a lot of ground, be it rushing the passer, dropping into zone coverage or taking a back out of the backfield, Young almost always lines up at left defensive end for the Lions. Lucky for them, his film study doesn’t stop with the right tackles. Young always makes sure to study the left tackles as well, because an injury might force him to play on the other side. 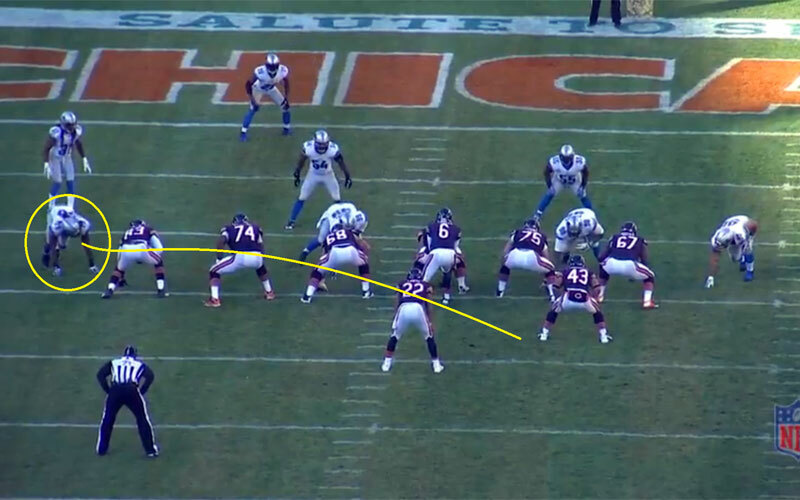 That came in handy against the Bears, because Young spent the entire second half matched up against left tackle Jermon Bushrod. And although Young didn’t record a sack, his five hurries and two hits—almost all of the occurring after halftime—tied him for eighth this week among edge rushers. 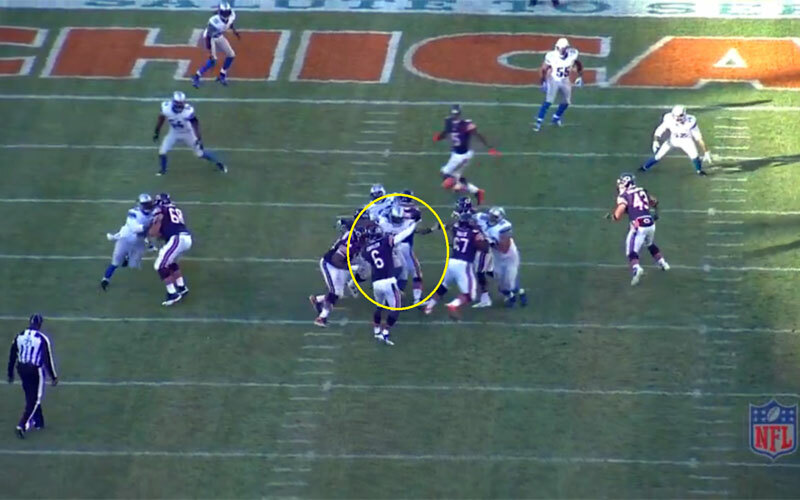 Young had a big hurry with 9:30 left in the game, when his inside rush on Bushrod was seen by quarterback Jay Cutler, who rushed pass to Alshon Jeffrey that was ruled incomplete in the end zone. On the game’s final drive, Young had a hit on backup quarterback Josh McCown—after diminutive receiver Earl Bennett first got a chip on Young—on an incompletion. This is a repeat win for Campbell, who also took the Week 5 honors. Even more impressive this time around: he compiled 5.0 pressure points without a sack, sack assist or drawn hold. It all came from his nine quarterback hurries and one hit. Campbell has been a bit inconsistent this season with his production, turning in four games with fewer than two pressure points. But the good news for the Cardinals is that the 8.75 he put up the past two games is his best two-game stretch of the season. Marks is one of the most underrated interior players in the league, mostly because of the team he’s on, but he shows up every week on film. Last Sunday against the Titans was no different. Marks didn’t have a sack, but he had a sack assist, four hurries and a huge drawn hold—in the end zone for a safety in an eventual 29-27 victory. 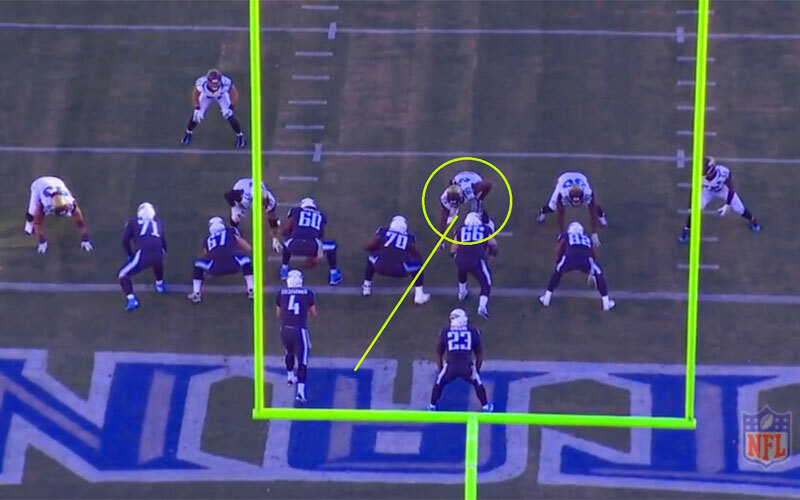 On that play, Marks simply walked Titans left guard Chance Warmack, the 10th overall pick in the draft, back toward quarterback Ryan Fitzpatrick, to the point where Warmack had no choice but to grab and turn Marks’ left shoulder, which drew the flag. One of biggest indicators of success for NFL defensive coaches is the ability to affect the quarterback. Sure, that means sacks, which are an official NFL statistic. And quarterback hits, which are also tallied in press boxes. But affecting the quarterback, making him feel pressure, has several other factors, most of which aren’t officially tallied (though NFL teams do them internally). We at The MMQB thought long and hard about finding a better way to evaluate quarterback pressure, both from individual and team standpoints. We’ve developed our own formula, which we think will highlight players who aren’t getting the glory stats (sacks) but are still affecting the quarterback just as much. The two statistics that we’ll be tabulating are sack assists and drawn holds. The latter is self-explanatory. Pass rushers are sometimes held by offensive lineman before they can sack the quarterback. Those plays aren’t official plays for the NFL. But they can be nearly as damaging. It’s a 10-yard foul, although there is no loss of down. A sack assist is given to a player who allows a teammate to get a sack. You see it all the time. One player comes flying at a quarterback, causing him to bolt, and the QB winds up in the arms of a different defender. Sometimes the sacker didn’t do very much, yet he still gets credit for the sack. The player who actually caused the sack gets nothing. We’re going to change that. Here’s how the formula works. Because not all sacks are created equally, we have divided up sacks into three categories: solo, assisted and easy. 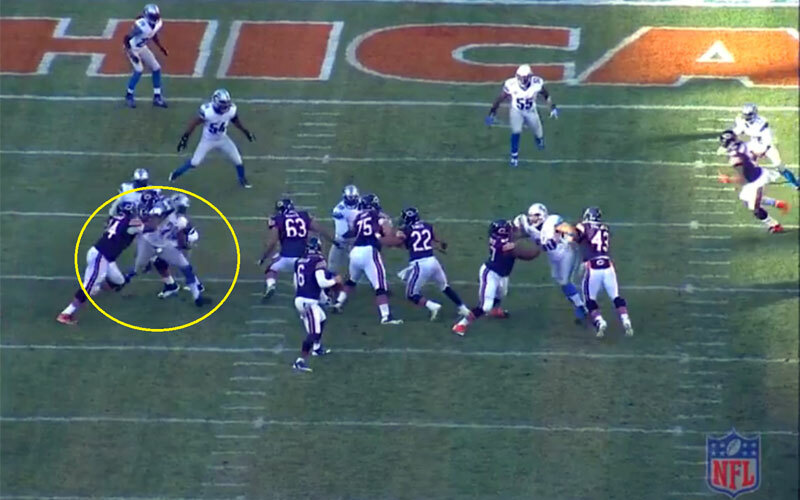 Solo sack (1.25 points): For the player who beats a blocker and gets the sack on his own. These are the real sack masters; they should be rewarded for their standout individual effort. Assisted sack (.75 points): Given to the player who officially receives a sack but had help from a teammate in taking the quarterback down. Easy sack (.75 points): An official sack that falls into one of the following categories: coverage sack (quarterback held the ball longer than 3.3 seconds because the coverage was so good); unblocked, usually because of a schemed blitz; offensive miscue, such as the quarterback tripping after getting stepped on by an offensive lineman; or garbage-time sack, which we have defined as a sack when the offense is trailing by more than two scores with four minutes or less remaining in the game. These three categories—drawn holds, hurries and hits—are not official statistics, but they’re extremely important. A team can have zero sacks, but if they accumulate hurries or hits, they’re making life extremely uncomfortable for a quarterback. The hurries and hits are shared with us by our friends at ProFootballFocus.com. Our hits and hurries include plays wiped out by penalty. Drawn hold (.75 points): The player who draws a holding penalty on a pass play. Only tabulated if the penalty results in a “no play.” If there is holding on a sack and the sack counts, there is no drawn hold—although that player could get a sack assist. Hit (.5 points): Recorded just after or as the quarterback releases a pass and goes to the ground as a result of contact with a defender.